Explanation: This stereo pair of Hale-Bopp images combines two pictures from slightly different viewing angles. 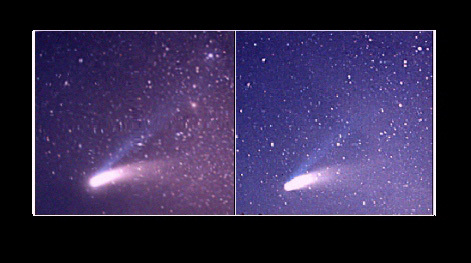 Simulating stereo vision, the difference was generated by the comet's apparent motion as it cruised through the inner Solar System. The camera was located in the Shoshone National Forest, Wyoming, USA, Planet Earth, and the two pictures were taken about 45 minutes apart on March 25. Digitized versions were then carefully cropped and adjusted so that the background stars matched. The product of an internet collaboration between J. Modjallal and M. Frost, this pair is meant to be viewed from a comfortable distance by gently crossing your eyes until the images merge. Tomorrow's picture: A Black Hole in M87?